They came by the singles, the couples, the handfuls, and the droves. This bright May Sunday morning, replete with possibilities, was filled with the aroma of fresh espresso and the distant, intermittent rumble of a biker, heading out for a morning’s run along the Turquoise Trail, to Golden or Madrid. But here in Barelas, the heart of Hispanic Old Albuquerque, is an eclectic mix of the educated, the gentried, the cultured, the avant-garde, who have forsaken their Sunday morning sleep-in, or other traditional commitments, and instead have gathered to hear a mix of the spoken word and the live musical performance, in a renovated former garage on what was once the original Rte. 66, the Mother Road. The Church of Beethoven is neither church, nor exclusively the domain of Ludwig’s bailiwick. It is instead the brainchild – heart child, really – of a cellist and former symphony orchestra conductor turned Neighborhood Arts Program Director, who has had the good fortune in life of being able to realize a long-sought dream of bringing the arts directly to a community, minus the institutional trappings of the conventional art world. Arriving an hour early, at least, is crucial to gaining the objective of a decent cup of espresso and a good seat. Former garages are not known for their sizable seating capacity, even with the installation of bleacher-style seats and the overflow capacity of a hodge-podge of office and patio chairs. 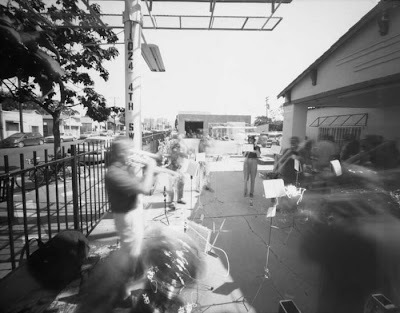 Serenading one’s arrival, whether by truck, sedan, bicycle or Harley, is a brass band, adjacent to the espresso table, wakening the sleepy neighborhood with a cacophony of jazz, pop, big band and folk. Across the street are a handful of tenants of a dormitory-style rental house, sitting on the curb in wonderment and awe at the unlikely goings on, appearing obviously unwelcome and uninvited. One must pause a moment and consider that the main body of audience members to this neighborhood arts outreach program live across town from this more humble, economically depressed area. Is it because of the ethnic mix, and obvious affluence, of the gathering, or are there more subtle and complex reasons for why they cannot merely step across the street and mingle and listen and enjoy? There is no entrance fee, merely a suggested donation. The printed program is merely a guide, not a roadmap, and certainly not a cultural GPS. Last minute changes seem to be the norm. The main speaker, a nationally famous poet, had car trouble the previous night on the way back from a gig – do poets have gigs? – in the southern NM town of Silver City, and so instead we are being treated to a last minute trio of poets, of whom one has had to quickly run home to retrieve his manuscript. Seated among the audience is a member of the New York Metropolitan Opera, and also the co-owner of a local arts cinema house, the last remaining one in town, after the corporate-owned cineplexes have completed their monopolization of the visual arts. An electric-powered Volkswagen sits on the grounds, the message “slow moving vehicle, please pass” stenciled on the back. A mongrel cur sits in the shade of the gallery’s eaves; later, during the Two Minutes of Silence (a conscious association with Orwell’s Two Minutes Hate arises), it will wander over to the garage-door-like entrance and suspiciously eye the assemblage. A baby cries; its mother cuddles it and saunters over to the gallery entrance, out of earshot of the experimental tonal composition being delivered via an Associate Professor of Oboe. During a previous Sunday’s presentation were read excerpts from Kerouac’s On the Road. After a lengthy piece by J.S. Bach, performed by a trio composed of flutist, oboist and cellist, the audience disperses, some to their vehicles, some to mingle and chat, and others to stand in line for another shot of espresso. I have noticed a pattern of interest in some of the more esoteric subjects that make up my personal oeuvre, and it interests me that they belong to categories as widely diverse as both visual and written media. It may also be noted that the format of this journal itself – a blend of photographic imagery with written text – mimics these patterns of interest. I have enjoyed a long-standing interest in the mechanics of photographic image making, writing, as well as less obvious forms of media, such as hand-operated numerical calculating devices, personal transportation and the temporal story-telling formats of video and audio recording. First, let’s explore the so-called visual media, such as still and motion photography. My approach to these two forms of visual media operates on widely distinct principles, with still photography the process of removing frozen segments of visual information from the objective world and representing these as two-dimensional fields of line, shading, tone and light. Distinctly different are the cinematic media of film and video, which operate in the realm of the temporal, and whose primary power of creative expression function via the process of montage, an assemblage of temporally discrete visual information recontextualized in a newly unique alternative temporal reality. Cinema, derived historically from theater, which in turn derives from the ancient oral and written story telling traditions, is loosely related to the written word. Similarities exist between the way paragraphs operate in prose and the visual paragraph of the scene. Montages, or linear assemblages of paragraphs or scenes, function to organize these disparate elements into a continual temporal context – the story. Individual photographic images interest me as Koans or short poetic statements. Sequences of such images, be they distinct as in the ‘slide show’ or continuous as in video and film, serve to function in a higher purpose of story telling. The ancient oral traditions of story telling are revived in the media of the audio production and the sound track that dominates video media. Many media observers have commented on the importance of the audio portion of a video or TV production, which seems to be much more important to the overall production than does the sound track in cinema. Bill Viola theorizes that this is not only due to the differences in picture size commonly seen in film and video presentations, but also is due to the heredity of video having been derived from radio technology, while film seems to possess more the genetics of theater. In the technology employed to create visual, written and aural impressions it seems curious that I am attracted to hand-crafted pinhole cameras and film formats easily hand-processed; simple portable writing devices like the fountain pen, the portable manual typewriter, keyboard-equipped PDAs and dedicated portable electronic writing devices such as the Neo and the older Radio Shack Model 100; and micro cassette and similar portable audio recording devices. All of these uniquely different tools possess certain common attributes toward which I seem to have the sensitivity to obtain a curiously strong sense of interest. Several other interests of mine seem to make a similar impression upon me, and seem to also possess similar aesthetic attributes. These are the hand-operated, bead-frame calculator known generically as the abacus, and small, one-person transportation conveyance devices such as bicycles, motor scooters and motorcycles. At first glance these seem not to be legitimate forms of ‘media’; however, only a little imagination is required to appreciate the similarities between mechanical devices that assist in the composing of letters into words, sentence and paragraphs and that of mechanical devices that assist in the composing of individual numbers into sums of columns of numerical values. It is relevant to also observe the mechanical similarities between the theory of the typewriter and that of the bead-frame abacus calculator; both being directly powered by the mechanical force of one’s fingers, and both employing a code that translates physical position with abstract, numerical or literal values. Less obvious is the connection between media and personal mechanical conveyance; yet here again we can discern some similarity in function if we regard physical conveyance as a medium translating one’s geographic preference into a form of creative expression. Note that there exists both a pragmatic as well as a creative or recreational purpose for all of these media, which we also observe present with personal conveyance devices. Also noteworthy are the mechanical attributes of simplicity and personal interaction between man and machine, the personal and the process, that all of these forms of creative expression seem to possess. 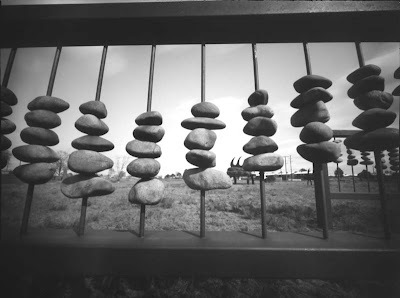 The limitations imposed by reality often prevent us from achieving our theoretical ideal, yet I continue to pursue the practical application to my daily life of pinhole photography, hand-written or typed prose, the practice of the abacus, and the small, personal transportation conveyance. As such, life seems to approach some personal sense of place and balance.